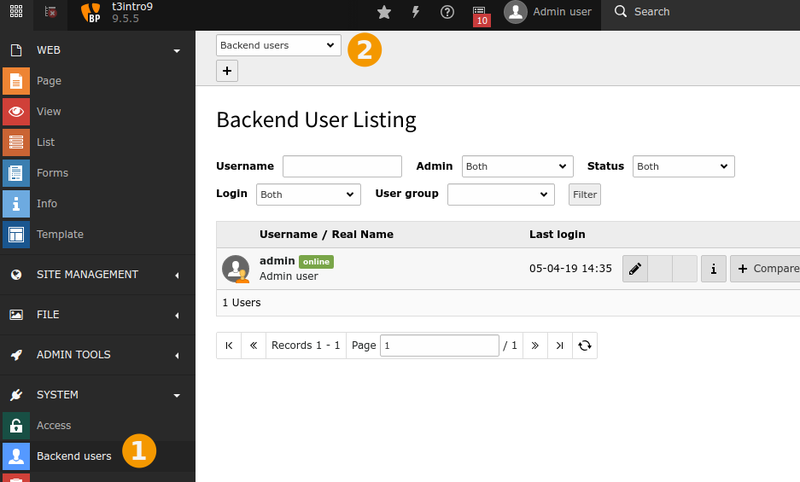 Managing backend users is best done using the SYSTEM > Backend users module. The module makes it possible to search and filter users. They can also be edited, deleted or disabled. The Introduction Package should create two default editors and groups for you: "simple_editor" and "advanced_editor". The following steps assume that the editors "simple_editor" and "advanced_editor exist". In some versions of the "Introduction Package", they will not get created. If these users do not exist in your installation, please follow the steps in Create Default Users before you continue. As you can see, this user only has access to the "Page" module. Furthermore its view of the page tree is also limited to the branch starting with the "Content examples" page. To switch back to the admin account, click on the user's name in the top bar and click the "Exit" button (note that this button normally reads "Logout"). The "advanced_editor" is allowed to use more modules than "simple_editor" but doesn't have any access to the page tree. This is probably a bug of the Introduction Package, but it makes for a good exercise for changing user rights in the next chapters. 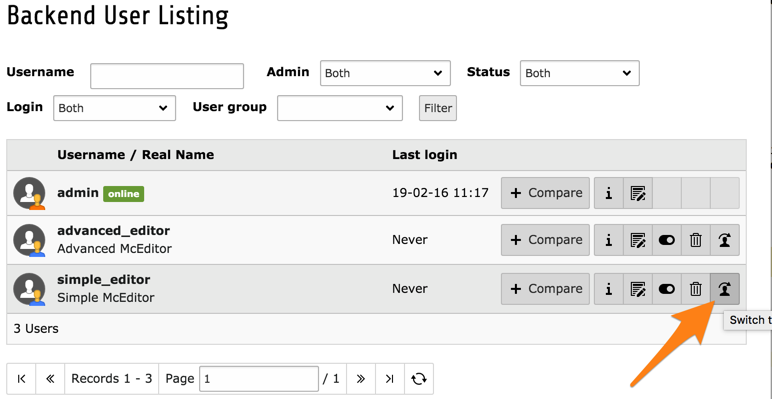 User records can also be accessed using the WEB > List module and clicking on the root node (the one with the TYPO3 CMS logo). 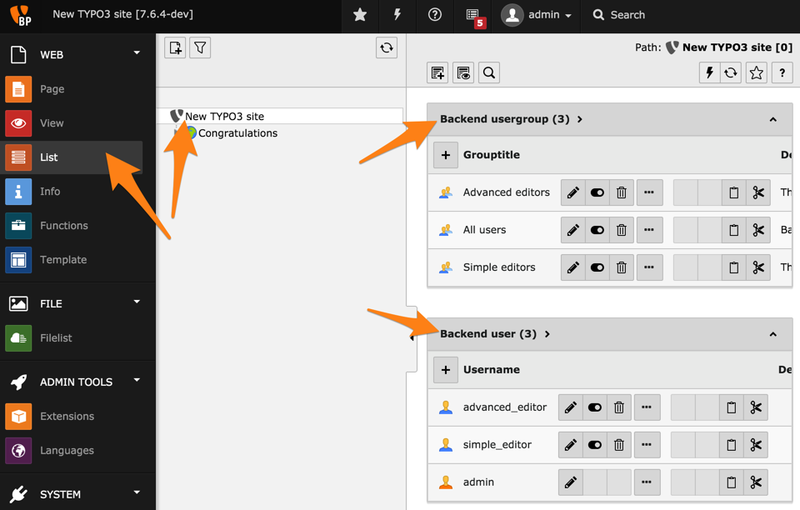 Introduced in TYPO3 CMS 9, there is a special permission for Backend Users. The first created user, during installation of TYPO3, is already marked as a System Maintainer. Other users can become System Maintainers only within the module Admin Tools > Settings > Manage System Maintainers. System Maintainers are the only users who are able to see and access the Install Tool and the Extension Manager. These users are persisted within the LocalConfiguration.php as $GLOBALS['TYPO3_CONF_VARS']['SYS']['systemMaintainers']. Also see changelog Feature: #82266 - Backend Users System Maintainers.